Step into classroom 1-2 and meet the coolest guy in school. In fact, Sakamoto may just be the coolest guy ever. And that's not just because he makes his student uniform and glasses look like a fashion magazine cover. There's also the fact that nothing ever seems to surprise or rattle him. The girls are all crazy for him, of course, but even the most macho delinquents start to feel a little funny when he's around. However, Sakamoto never seems to notice, let alone take advantage of the attention. He's too busy being cool and mysterious without even trying! This does drive some people crazy, but the more someone tries to challenge Sakamoto, the more they start to fall under his spell. Intrigued? Then come join the class and get a lesson in cool from the master in Haven't You Heard? 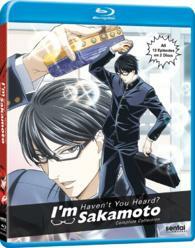 I'm Sakamoto!